The biggest floating solar farm in Europe is being constructed on a reservoir. 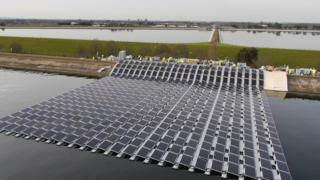 More than 23,000 solar photovoltaic panels are being laid on the surface of the Queen Elizabeth II reservoir near Walton-on-Thames, Surrey. The farm, which will be the size of eight football pitches, is expected to generate 5.8 million kilowatt hours of electricity in a year. The energy will be used to part power a nearby water treatment works. Thames Water said construction of the solar farm, which is about eight miles (13 km) from Heathrow airport, will be completed by the end of March. The floating pontoon will be 57,500 sq m in size. The power created by the farm will be the same as the annual consumption of about 1,800 homes, Thames Water said. The reservoir is run by the water company, while the farm is being funded and operated by solar energy company, Lightsource. Thames Water's energy manager, Angus Berry, said the farm would help the firm become a "more sustainable business". The previous largest floating solar farm in Europe was opened in Hyde, Greater Manchester, at Christmas. It measures 45,500 sq m but it and the new farm are both dwarfed by the world's largest. Japanese company Kyocera is building what will be the biggest floating array on Yamakura Dam in Chiba Prefecture, which will measure 180,000 sq m when completed.